Rail Baltica (in Estonia also known as Rail Baltic and the Baltic part referred to as the Rail Baltica Global Project) is a greenfield railway infrastructure project to link Finland, Estonia, Latvia, Lithuania and Poland with a European standard gauge rail line, providing passenger and freight service between the countries and improving rail connections between Central and Northern Europe as well as acting as a catalyst for building the economic corridor in the Northeastern Europe. It envisages a continuous rail link from Tallinn (Estonia), to Warsaw (Poland), via Riga (Latvia) and Kaunas (Lithuania) with the link to Vilnius (Lithuania). Rail Baltica is one of the priority projects of the European Union: Trans-European Transport Networks (TEN-T). Rail Baltica will be fully electrified, therefore any local emissions will be avoided. The newest technologies and materials are going to be utilized in its construction. The line is planned avoiding the Natura 2000 protected areas as far as possible and without making a significant impact on other environmentally sensitive protected areas, and existing 1,520 mm gauge railway networking areas. Wherever necessary, noise protection barriers will be installed. Special animal passages will be built through the embankment. In the Baltics, Rail Baltica will enable both intermodality and multimodality. Plan includes three key multimodal freight terminals – in Muuga (Estonia), Salaspils (Latvia) and Kaunas (Lithuania) – building synergies with existing 1,520 mm railway system infrastructure, seven international passenger stations (in Tallinn, Pärnu, Riga, Riga Airport, Panevežys, Kaunas, Vilnius) with potential regional stations and connections to airports and seaports. Its parameters are according to the EU Technical Specifications for Interoperability (TSI – P2, F1). The planning phase of Rail Baltica implementation in the Baltics took place from 2010 to 2017. The design phase started in 2016 with design activities at the Riga Central Passenger Station and the Riga International Airport passenger station in Latvia to be continued till 2023. Meanwhile, the construction of the Rail Baltica infrastructure is planned to start in 2019 and should be completed in 2026. The section from Helsinki to Tallinn will be operated by existing commercial ferries. In the future a proposed Helsinki to Tallinn Tunnel could provide a rail link between the two cities. The length of the railway between Tallinn and Warsaw will be at least 950 kilometres (590 mi). Total length of the Baltic railway part: 870 km. In 2017, all three Baltic parliaments ratified the Inter-Governmental Agreement for the Rail Baltica project, thereby confirming their long-term commitment to the Rail Baltica project. In addition, Rail Baltica Global Project's Cost-Benefit Analysis was delivered by Ernst & Young and Atkins International experts, based on the European Union's CBA guidelines, proving that the project is financially feasible and viable, and its measurable benefits will outweigh the costs. On 14 February 2018, the Ministry of Public Administration of the Republic of Estonia approved the spatial plan for the Rail Baltica railway in Estonia, leading to the setting of the final route and preliminary design of the railway in this northern Baltic State. The spatial planning for the entire line was approved in Latvia by the decision of the Latvian Government in August 2016, and followed by the approval of the Lithuanian Government in January 2017 for their respective section from Kaunas to the Lithuanian-Latvian border in Lithuania (The route for the section Kaunas–Lithuania/Poland State border, known as Rail Baltica I, is subject to the results of the Upgrade Feasibility study). In the light of Estonia's decision, the spatial territorial planning and preliminary technical design of the Rail Baltica railway in the Baltic States has been finalised. The Rail Baltica project has entered the design phase in all three Baltic States with the approval of the Detailed Design Guidelines for Rail Baltica, continuing the work on the consolidated preliminary technical design, tendering the detailed technical design services, preparing BIM strategy. On 20 March 2018, the first Rail Baltica construction design and supervision contract of Rail Baltica's Riga International Airport railway station, related infrastructure and viaduct was signed by "Eiropas Dzelzceļa līnijas" SIA and the winner of the open International tender – partnership of suppliers from three countries "PROSIV" ("Sintagma" (Italy), "Prodex" (Slovakia) and "Vektors T" (Latvia)). During the Rail Baltica Global Forum 2018, the project implementers introduced the plans for the Rail Baltica design phase to around 500 suppliers from 24 countries. In 2018, it is planned to finalise the long-term Business Plan, Operational Plan, the Upgraded Feasibility Study of the European gauge railway line from Kaunas to Lithuanian/Polish border, Infrastructure Management Study and other studies related to commercialisation and supply materials. The Rail Baltica project is being implemented by the three Baltic States – Estonia, Latvia and Lithuania. Finland announced in February 2019 that it will also join the project. The Beneficiaries of the Rail Baltica project are ministries of the three Baltic States – Estonia's Ministry of Economic Affairs and Communications, Latvia's Ministry of Transport and Lithuania's Ministry of Transport and Communications. In 2014 they established a joint venture RB RAIL AS to be the Main Coordinator and project implementer for the purpose of completing the railway and developing the Rail Baltica project. Its main business is the design, construction and marketing of the railway. RB Rail AS also submits EU financing proposals for the Rail Baltica purchasing body for all parties for the procurement of studies, plans, designs for the global project, sub-systems (Control, Command, and Signalling and Energy/Electrification), raw materials and key components, and cross-border track sections. Rail Baltic Estonia OU and the Estonian Technical Regulatory Authority in Estonia, Eiropas Dzelzceļa līnijas SIA in Latvia, Rail Baltica statyba UAB and Lietuvos geležinkeliai JSC in Lithuania are the national Implementing Bodies, to be joined by Finland's Oy Suomen Rata AB subsidiary Rail Baltica Company. All constructon carried out by the implementing bodies is done under the supervision of RB Rail AS and is based on common procurement principles, rules and contract templates. The total estimated cost of the Rail Baltica Global project is 5.8 billion euros in all three Baltic States according to the Cost-Benefit Study carried out by EY in 2017. The Feasibility study of Rail Baltica in the three Baltic States carried out by AECOM in 2011 had estimated cost of 3.6 billion euros for the railway and proved that Rail Baltica is economically viable. Based on that study, key political and practical decisions – both on the national and EU level – were made to implement Rail Baltica. Since the AECOM study the project has matured, and essential elements have subsequently been added to the Rail Baltica Global Project for better connectivity, passenger mobility and inter-modality. Additions to the Global Project include routing the Rail Baltica passenger mainline through the Riga International Airport and construction of the airport passenger station (Latvia), the Kaunas–Vilnius connection (Lithuania), an improved connection in Kaunas city (Lithuania), and construction of the tram line "Ülemiste-Tallinn airport" (Estonia). Moreover, the Environmental Impact Assessments, spatial planning and some preliminary designs have been prepared allowing to better estimate the investments needed for the project. Thus, in April 2017, the overall cost of the Rail Baltica Global Project implementation in three countries, including the construction of the Kaunas-Vilnius section, was estimated at about €5.8 billion. According to the Ernst & Young (EY) cost-benefit analysis, the project's economic feasibility and benefits society will gain was proved, providing the necessary updated parameters for continued EU and national co-financing of the project. The project's profitability lies in its wider socio-economic benefits, which are estimated by EY at around €16.22 billion. In addition, there will be several immeasurable (mostly, catalytic) benefits that would be created by Rail Baltica through regional integration, tourism development, new business creation, increased attractiveness to FDI, access to new export markets, technological transfer, innovation, etc. The project is financed by the member states and the European Union TEN-T budget, and the Structural and Cohesion Funds provided to the EU New Member States. By the start of 2018, the three Baltic States and RB RAIL AS have received two grants designed under the CEF for the construction of the Rail Baltica railway, having signed Grant Agreements with a total value of 765 million euros. As of 13 July, third Grant agreement was signed for the total amount of 130 million euros from which 110 million euros is CEF contribution. In 2011, the three Baltic States agreed on a route connecting Tallinn, Pärnu, Riga, Panevėžys, and Kaunas. A feasibility study for this option estimated the line will cost about €3.68 billion in total. Option one was to upgrade the existing railway from Joniškis via Riga and Tartu to Tallinn to 160 km/h, keeping the current Russian gauge and state-owned, and a new railway from Kaunas–Joniškis with 160 km/h, also at Russian gauge and state-owned. Because of the break of gauge at Kaunas, passengers would have to change trains there. For freight, a reloading facility or a bogie exchange station would be placed near Kaunas. This option was already completed as Rail Baltica I. Option two was a new railway with 200 km/h (120 mph) speed standard gauge (with 3 kV DC, the same voltage as in Poland) from Kaunas via Joniškis to Riga, as above, but then continuing in a shorter, straighter line via Pärnu to Tallinn. This option was chosen as the preferred route. During the planning of the location of the project route in the Baltic States a conceptual agreement among the three Baltic States was reached that it should be as straight as possible as it provides the highest benefits at the lowest cost. The shorter and more direct the route is, the faster traffic it is possible to ensure, which economically has the highest advantage compared to its alternatives. This was confirmed by the AECOM study in 2013, analysing the four possible options of the location of the route in all three Baltic countries. In 2017, the Parliaments of the three Baltic States ratified the intergovernmental Agreement on Rail Baltica stating "route" shall be from Tallinn though Pärnu–Riga–Panevezys–Kaunas to the Lithuanian/Polish state border with a connection of Vilnius–Kaunas as a part of the railway and defining the design speed 240 km/h for passenger travel. Now the Rail Baltica Global Project route is aligned from Tallinn till Kaunas with already built European gauge railway line section from Kaunas-Lithuanian/Polish border being subject to the results of the Upgrade Feasibility Study. Nevertheless, in April 2018 the Ministries of the three Baltic States approved the Design Guidelines of Rail Baltica, which states that the maximum design speed will be 249 km/h and maximum operational speed should be 234 km/h. The name Rail Baltica is also sometimes used to mean the first phase of European gauge railway construction from the Poland-Lithuania border to Kaunas in Lithuania. It was inaugurated on 16 October 2015. The project, which built European standard-gauge one track alongside the existing Russian gauge tracks, cost €380m. The 119 km line accommodates diesel trains, with passenger trains running at up to 120 km/h and freight trains at up to 80 km/h. Higher speeds will depend on future electrification and a new signal system. In June 2016, Lithuanian Railways and Przewozy Regionalne started weekend passenger train service between Kaunas and Białystok. In Estonia and Latvia, implementation of the Rail Baltica I project contained upgrade of the existing rail lines in the region. The 66 kilometres (41 mi) long Russian gauge line from Tartu to Valga (on the Latvian border) in Estonia was renovated between 2008 and 2010. The work was done by the Finnish VR Group for a cost of €40M. The Šiauliai-to-Latvian border rail section (using broad gauge) will be newly-built and to be finished in 2015 with an estimated cost of €270M. In Latvia, the existing railway upgrade between Riga and Valka at the cost of €97M was finished 2016. The EU will contribute about 25% of the cost for the three parts. When talking about the benefits of the project, it is pointed out that the Baltic railway infrastructure will be connected to the European railway corridor and will ensure the high-speed passenger travel and freight movement. Rail Baltica creates the possibility to shift the major freight transport in the regions from road to rail, which for the time being is transported towards Russia and then north by heavy trucks. In the case of Poland the trucks follow the local roads and directly cross the villages of Podlaskie Voivodeship. Rail Baltica will act as a powerful catalyst for sustainable economic growth in the Baltic States, will provide a new standard of passenger and freight mobility, sustainable employment and educational opportunities, an environmentally sustainable infrastructure, new opportunities for multimodal freight logistics development, new intermodal transport solutions for passengers, a new value platform for digitalization and innovation. Rail Baltica will ensure safety and performance improvements. According to the Cost-Benefit Study (2017), due to construction of Rail Baltica, there will be 7.1 billion euros saved in climate change and noise reduction, relevant track traffic flow shift to railways – 30-40%, 13,000 jobs created during the construction phase, 5.3 billion euros saved for passenger and freight travel, 5.3 million passenger hours saved and 400 human lives saved in 29 years. All in total, measurable socio-economic benefits are estimated at 16.2 billion euros. The assessed GDP multiplier effect the Rail Baltica Global Project would create is an additional 2 billion euros. There will be substantial unmeasurable benefits. Criticism started after a feasibility study by AECOM was published, with the government of Lithuania keen to include a link to Vilnius. The mayor of Tartu, Estonia's second largest city, called for the city to be included in the route. In 2017 several Estonian environmental groups claimed that the lack of public participation on the decision made by Baltic governments and building of a new line, rather than upgrading the existing network, is in conflict with the Aarhus Convention. The Estonian Association for the Club of Rome advised the government to abandon the Rail Baltica route. Problems in the environmental assessment programme have also been claimed. In 2016 and 2017, three open letters  were composed in Estonia by public persons including scientists, academics, and architects who called on the Estonian government and parliament to stop the project in its planned form. The main arguments in these letters were that the new track as a greenfield project will cause too much damage to nature and does not essentially improve travel possibilities. On 8 June 2017, Priit Humal, Karli Lambot, Illimar Paul and Raul Vibo, experts on logistics and engineering, published a critical analysis  of the Rail Baltica Cost-Benefit Analysis made by EY (formerly Ernst & Young) where they claimed that €4.1 billion of the stated socio-economic benefits are faulty and therefore the Rail Baltica project is neither feasible nor eligible for EU financing. They asked for comments from RB RAIL AS, the Rail Baltica coordinator, who provided answers four months later. On 18 September 2017, a meeting between Estonian pro-transparency NGO Avalikult Rail Balticust (MTÜ ARB, Openly About Rail Baltic) and representatives of the joint venture RB RAIL AS in Riga was cancelled as the latter did not allow the meeting to be recorded. On 16 January 2018, Priit Humal, Karli Lambot, Illimar Paul and Raul Vibo published a 73-page study  that includes replies from EY, RB RAIL AS and the European Commission. The authors of the study claim that issues raised in their previous analysis were not adequately addressed in the official replies, and that therefore Rail Baltica will be detrimental to society. On 10 April 2018, an open letter of 424 leading intellectuals of Estonia was published, suggesting stopping the whole plan in its current form. ^ "Technical Parameters". RB Rail AS. Retrieved 2017-10-11. ^ a b "Rail Baltica – Project of the Century". www.railbaltica.org. Retrieved 2018-05-24. ^ "Latviannews.lv". www.latviannews.lv. Retrieved 2018-05-24. ^ "Technical specifications for interoperability". www.era.europa.eu. Retrieved 2018-05-24. ^ "Rail Baltica is your future | Rail Baltica". www.railbaltica.org. Retrieved 2018-05-24. ^ a b c "AGREEMENT OF THE DEVELOPMENT OF THE RAIL BALTIC/RAIL BALTICA RAILWAY CONNECTION" (PDF). ^ "Helsinki-Tallinn Rail Tunnel Link?". YLE News. 31 October 2008. ^ a b c d e EY. "Rail Baltica Global Project Cost-Benefit Analysis Final Report" (PDF). ^ "Route setting and spatial territorial planning for Rail Baltica railway finalised in all three Baltic states | Rail Baltica". www.railbaltica.org. Retrieved 2018-05-24. ^ "The first Rail Baltica construction design and supervision contract signed in the Baltics - Edzl". edzl.lv (in Latvian). Retrieved 2018-05-24. ^ "Rail Baltica Global Forum 2018, 10-11 April, Tallinn, Estonia". www.railbaltica.org. Retrieved 2018-05-24. ^ "Annual Press Conference of the Rail Baltica implementers | Rail Baltica". www.railbaltica.org. Retrieved 2018-05-24. ^ Estonian Public Broadcasting, BNS | (2019-02-03). "Finland to formally join Rail Baltica joint venture". ERR. Retrieved 2019-02-15. ^ a b "Finland to join the Rail Baltica Joint Ventures as a shareholder | Rail Baltica". www.railbaltica.org. 2019-02-05. Retrieved 2019-02-15. ^ "Finland will take part in Rail Baltica". RailTech.com. 2019-02-04. Retrieved 2019-02-15. ^ Shah, Shakhil (2019-02-05). "Finland hops on board Rail Baltica". Emerging Europe. Retrieved 2019-02-15. ^ "Main Coordinator". www.railbaltica.org. Retrieved 2018-05-24. ^ "Project Implementers". www.railbaltica.org. Retrieved 2018-05-24. ^ "Rail Baltica Final Report" (PDF). ^ "Trans-European Transport Network (TEN-T): selection of projects for the TEN-T multi-annual programme 2007–2013 and the annual TEN-T programme 2007" (Press release). European Union. 21 November 2007. ^ "Third CEF Grant Agreement for Rail Baltica Global project signed". Rail Baltica. Retrieved 23 July 2018. ^ "Rail Baltica's fate to become clearer by the end of May" (PDF). March 2011. ^ "Project Rail Baltica would cost EUR 3.68 bln". June 2011. ^ a b European Commission, Directorate-General for Regional Policy (January 2007). "Feasibility study on Rail Baltica railways" (PDF). ^ "Rail Baltica Route Setting in the Baltics | Rail Baltica". www.railbaltica.org. Retrieved 2018-05-24. ^ "Rail Baltica Design Guidelines Approved | Rail Baltica". www.railbaltica.org. Retrieved 2018-05-24. ^ "Mid-Term Review" (PDF). Detailed report from 2010. 2010. pp. 161–172 (PDF). Archived from the original (PDF, 65 MB) on 2012-11-03. 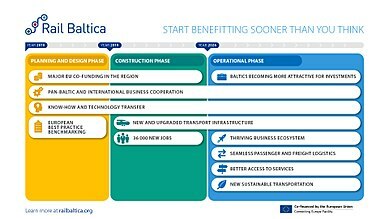 ^ "Benefits | Rail Baltica". www.railbaltica.org. Retrieved 2018-05-24. ^ Barrow, Keith (11 March 2014). "Governments edge towards consensus on Rail Baltica". International Rail Journal. ^ "Current Rail Baltic route through Latvia publicly approved". ERR. 30 November 2016. ^ "Tartu-Valga Rail Baltic Route Should Be Considered, Says Tartu Mayor". ERR. 17 January 2014. ^ "Estonian ex-PM: Ratification of Rail Baltic accord will result in litigation". Baltic Times. 15 June 2017. ^ "Eesti Rooma Klubi soovitab Rail Balticust loobuda". ERR (in Estonian). 15 November 2013. ^ Arumäe, Liisu (7 November 2013). "Expert says Rail Baltica endangers Tallinn drinking water". Postimees. ^ Cancel Rail Baltic in its current form. ^ English version of the public letter of the 400. This page was last edited on 15 April 2019, at 19:54 (UTC).